Madame Nottale – harbouring a deep well of creativity. My first encounter with Madame Nottale was when I was invited to dinner at the family home in Marley le Roi – (south west of Paris) in 1983. She made a huge impression on me at the time. 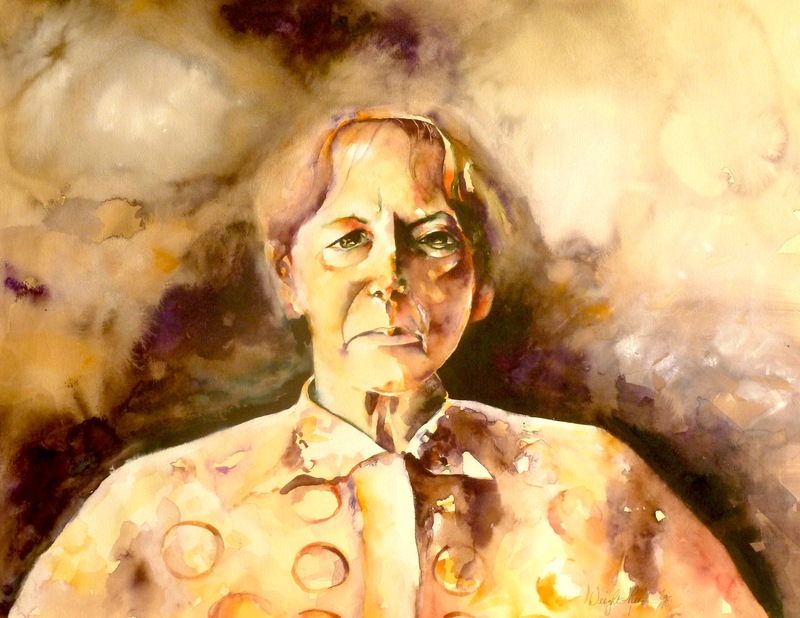 I first painted her in 1994 (above portrait watercolour/gouache)…..At which point Madame Nottale was raising her family of eight children and working full time as a nurse. Three years ago, I visited Madame Nottalle in a nursing home situated in the historic district of Le Pecq, also south west of Paris. Interestingly, it’s an area I am familiar with as I have other friends who live almost next door to the home. It’s what I call a personal ‘hot spot’ – a subject I will write more about in a future blog. 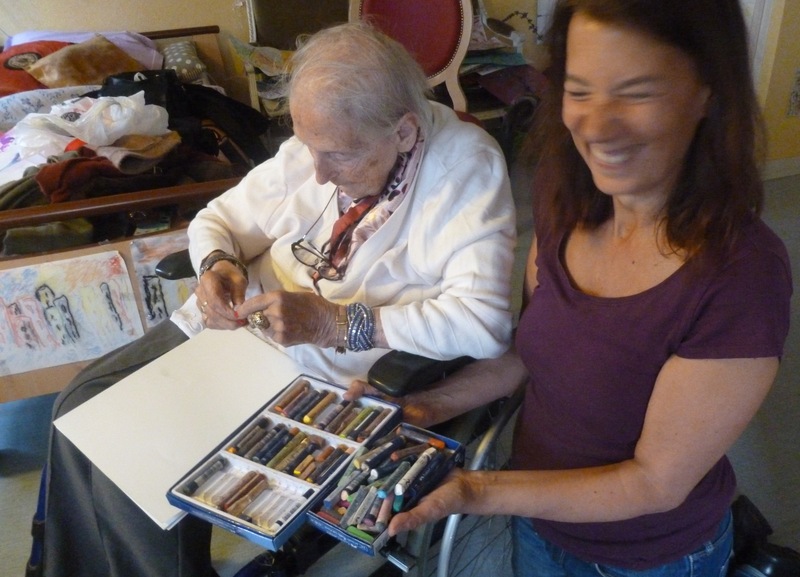 After entering the nursing home, seemingly from out of the blue, Madame Nottale began to paint and write every day. 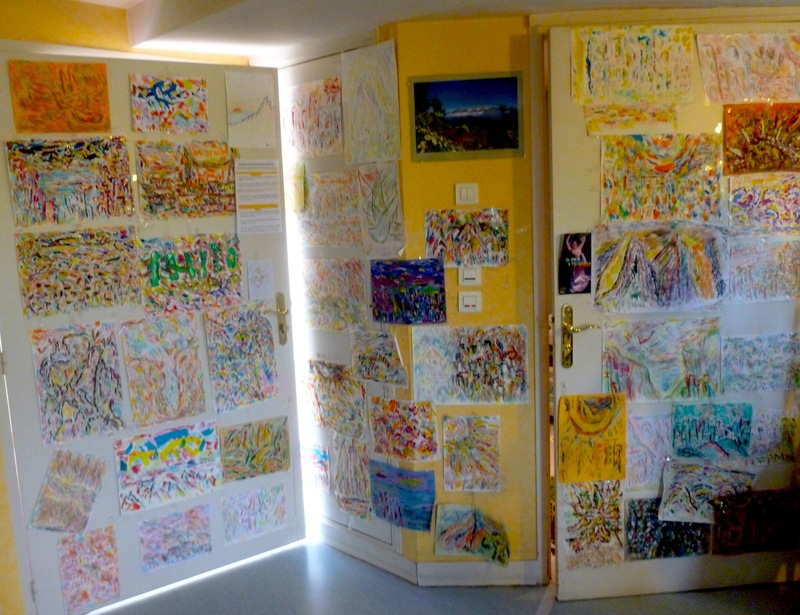 When I arrived at her room, I was amazed to see her paintings and drawings covering every surface available. A fraction of the work on display……. 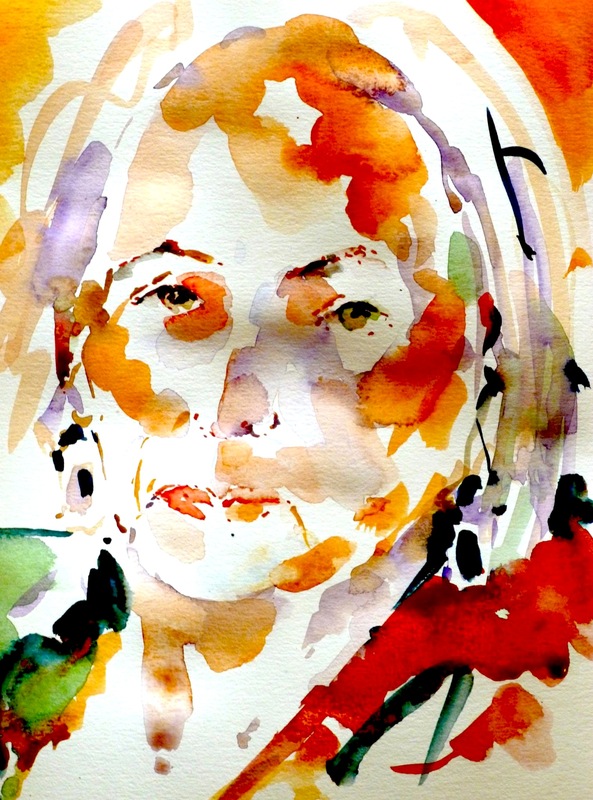 It was thee years ago when I painted this quick watercolour which expresses the profound changes that had become evident in her face. She had been liberated – and given the space and time to tap into a deep well of creativity which she had been harbouring all of her life. Last week when I was in Paris, once again I had the great privilege to make a watercolour of this amazing lady. Now 92, she no longer speaks but says everything with eyes which sparkle with life. 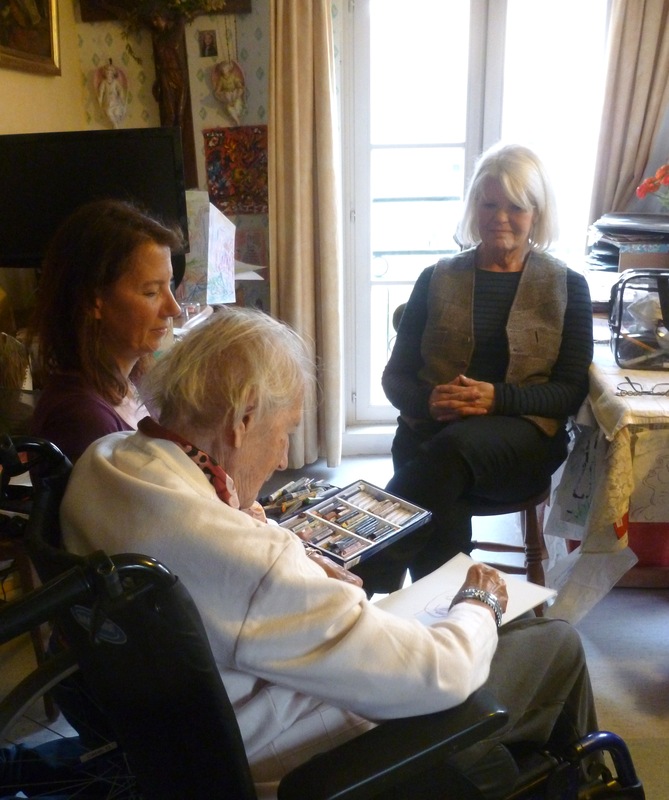 Even better – Madame Nottale made a drawing of me…….here she is selecting a pastel….with daughter Claudia, who I have known since 1974. From this point of view, it was interesting for me to observe Madame Nottale’s astute observational skills. The finished drawing….which I will always cherish. It is signed AN – Annette Nottale. Along with painting, Annette is writing remarkable poems and essays. Her son, Laurent, was telling me that some of the language used in the poems goes back to Annette’s early childhood when she and her brother lived with foster parents on a farm. It is language that wouldn’t be used to day….language and thoughts that have been harboured throughout her life. 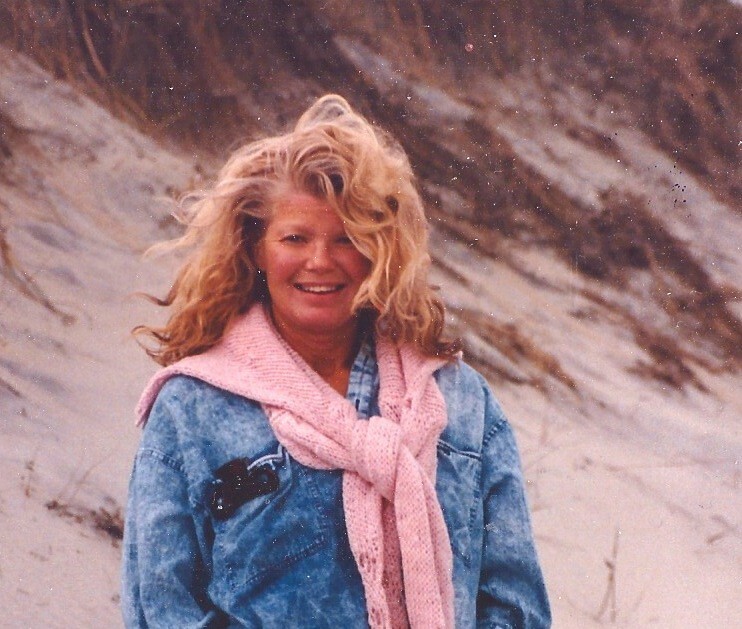 It’s a joy to see the life and energy within her work and being…..to say that she is inspirational is an understatement. 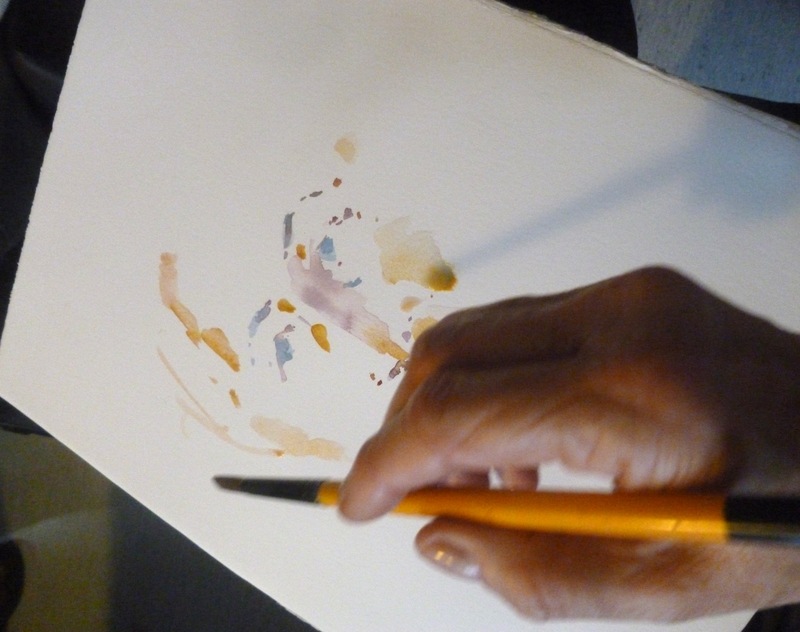 Watercolour last week of Madame Nottale – in progress. The plan is for a film to be made of Madame Nottale at work, along with an exhibition of her paintings and writings. I feel that this would be very important. It would show that it is never too late to draw from within…..to immerse oneself into the joy and fulfilment of the creative process. Needless to say, I came away feeling inspired and uplifted. More about my Paris trip to follow. This entry was posted in Uncategorized and tagged a well of inspiration, hot spots, Le Pecq France, madame nottale artist, Marley le Roi, never to late, notre dame ehpad le pecq, observational skills, watercolour/gouache portraits on October 26, 2015 by janetweightreed10.